This musical ottoman is definitely designed for those with money to burn. Something as pretty as this with incorporated technology never goes for cheap. However, for those that can afford furniture like this, it means you don’t have to have speakers lying out that are quite obviously speakers. With this it makes things a lot more subtle. Of course it will be quite a bit more obvious when your iPod is plugged into it and sitting on top of the ottoman. 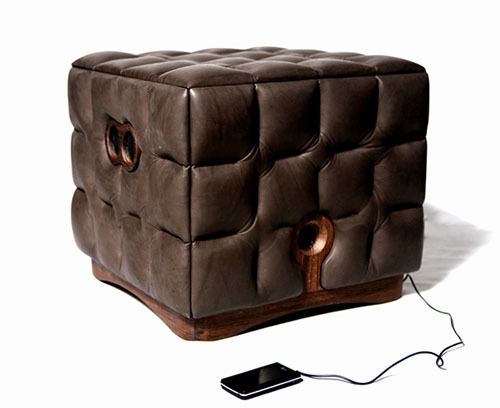 This Music Chocolate Ottoman was designed by Michi Jjung, which of course means it is just a design. Which is bad news for those that were more than willing to fork out the extra cash for this upholstered ottoman. However, sometimes you can contact the designer to find out if you can get your hands on one, despite that these aren’t posted online for sale. If you can manage to get one, you’ll always have a speaker nearby when you’re lounging to plug your MP3 player into. Oh, what a great idea! I love chocolate! So, instead of buying a bar of chocolate I can sit on a huge cube of chocolate and listen to music. Great ;-)!